The American Southwest Virtual Museum hosts a growing collection of pottery, including ceramic vessels, some of which are animated, type sherds, visual guides to terminology and types, as well as identification guides for each ware and type of pottery in the exhibits. Click the image to go directly to the Pottery gallery. Terminology and Type Sherds – This gallery provides visual guides for identifying design elements, motifs, layouts, and vessel forms, as well as recreations of Harold Colton’s original type sherd pages. Interactive Vessels – Viewers can zoom in on and turn the vessels in this gallery! To go directly to the full Pottery image gallery, click the picture at the top of the page. To browse the identification pages, use the menu links or select from the list below. 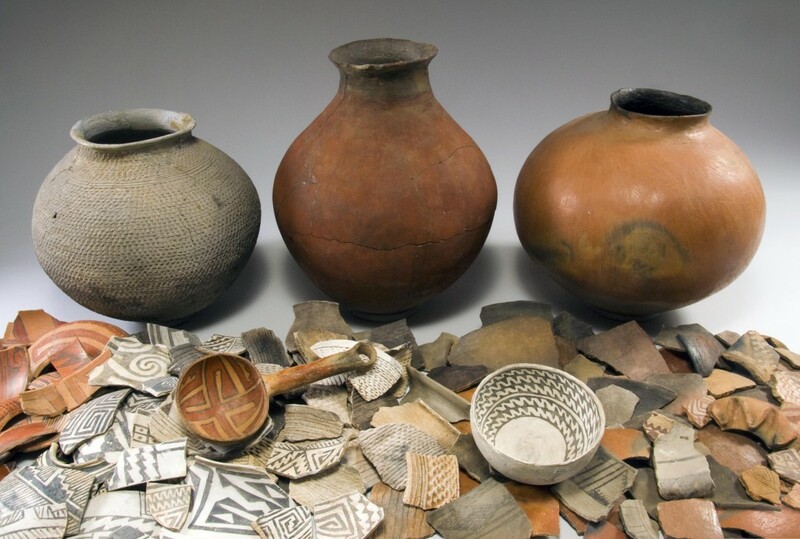 Acoma Wares – The identification pages have not yet been written for these pottery types. This link will open the image gallery instead. Hopi Wares – The identification pages have not yet been written for these pottery types. This link will open the image gallery instead. Navajo Wares – The identification pages have not yet been written for these pottery types. This link will open the image gallery instead. Tizon Brown Ware – The identification pages have not yet been written for this ware. This link will open the image gallery instead. Winslow Orange Ware – The identification pages have not yet been written for this ware. This link will open the image gallery instead. Zuni Wares – The identification pages have not yet been written for these pottery types. This link will open the image gallery instead.